Across the Planet, thousands of students and children have participated in a series of protests and marches against the role of the world’s governments in perpetuating climate change, under the banner of ‘Youth Strike 4 Climate’, which has been greatly inspired by the works of Greta Thunberg, a 16-year-old climate activist, in Sweden. These protests have received a great deal of attention from both the public and mass media outlets, and, despite many people questioning the rational behind, and efficacy of, these protests, they have successfully garnered a large amount of awareness and support regarding the movement against anthropogenic climate change. In Cardiff, there have been two of these protests so far, which occurred on the 15th of February and March respectively and were attended personally by myself. The first of these protests was a static protest that took place in front of the National Assembly of Wales, and was attended by hundreds of students, as well as a handful of older protesters. This protest, which successfully garnered the attention of the local media and passing people, involved a bilingual, passionate array of posters and chanting, which were accompanied by music from the participants of the protest, including a group of primary school children. Despite the focus of the protest being placed upon fossil fuels, there was a conscious anti-capitalist sentiment, which was shared by many of the protestors, including a hopeful number of young anarchists. The protest was followed by the reading of an Open Letter, which made a series of demands for actions against climate change, to the Welsh Assembly, and this reading was, in turn, immediately succeeded by a series of speeches from a diverse variety of speakers from the crowd. Speakers from as far from Wales as Ecuador and Nigeria criticised the role of consumerism and imperialism in causing climate change, and there were speeches made in direct opposition to the inaction of the ruling bureaucracy, evidencing the growing consciousness of the youth of the planet regarding the systematic nature of the problems, including climate change, that face Humanity and the Planet. The second protest in Cardiff differed from the previous protest as it, after an initial gathering in front of the Cardiff City Hall, began with a march to the National Assembly building. Although the total number of protesters was similar to, if not greater than, the first protest, there was a greater proportion of older students, indicating that the protest would have been even larger, if the weather had been more suitable for younger children and their families. It may also be worth noting that many of the participants at this protest were also present at the previous protest, evidencing their dedication and passion for their cause. Despite the poor weather conditions, the protest remained well-attended and in good spirits, with loud chants, which held an especially strong anti-capitalist sentiment, being passionately maintained throughout the entirety of the march, which received direct calls of praise and encouragement from many of those who witnessed it. Unfortunately, the march was forced to follow the directions of the police, who recorded the protest with cameras, despite the young age and lack of consent from its participants, demonstrating the State’s constant surveillance and attempted control of potential threats to its power; however, the presence of the police failed to stifle the vocal criticisms of the protesters regarding the Government and capitalist system. Upon arriving at the Assembly, a static protest was maintained, which again successfully garnered attention from the local media; there was a certain sense of solidarity amongst the participants of this protest as they chanted, jumped, sang and socialised with one another. The protest was followed by the reading of a second Open Letter to the Welsh Assembly, promising further action if the demands of the previous letter were not met. Despite the sympathies of some of the speakers, who were members of the Youth Parliament, towards the Government, the majority of the speeches were critical of our current political, economic and social systems, as well as the role of the state and corporations in both failing to address and directly causing climate change, and maintained an international diversity of speakers, further evidencing the international nature of the movement against anthropogenic climate change, and the growing consciousness of the World’s youth regarding the systematic issues of society. The Youth Strikes in Cardiff and elsewhere have effectively garnered a large amount of awareness regarding climate change and the movement against it, and have successfully created the public pressure to force states and other oppressive organisations to begin to act to mitigate anthropogenic climate change and its effects. 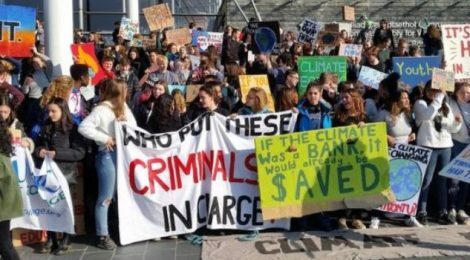 This has been demonstrated by the recent declaration of a ‘Climate Emergency’ by many local councils across Britain, including that of Cambridge, which has stated that the youth strikes were a direct influence on their decision. While a large amount of the decisions and changes in policies of these bureaucracies, and the larger, encompassing state will be inadequate, as they will fail to truly address the root, systematic causes of anthropogenic climate change, we should not besmirch any pressure that has been successfully applied against such oppressive organisations, and should, instead ensure that such pressure is maintained and further developed, and encourage an understanding of the need for the decentralisation of power and the abolition of hierarchies, so that it may eventually inspire and cumulate in a powerful force, free from dependence on any state, for the introduction of more effective changes. An additional, and perhaps more important, success is that these protests have helped to embolden and empower a generation of people, who will now have a greater deal of experience and confidence in the ability of themselves, their peers and their cooperative actions to inspire and instigate the changes that they would like to see in society, and have helped to encourage an increased understanding and the resultant criticisms of the systematic issues of our society, and the states and capitalist organisations that perpetuate them, amongst the Youth of the planet. The Youth Strikes have also helped to expose to their participants, and to their supporters, the falsehood of the narrative that the State exists to serve and aid, as opposed to suppress, the will of the People, as it has exposed the harmful policies of the Government, and its continued failure and refusal to accept, or even, as demonstrated by the infamously poor attendance at Parliament’s recent debate regarding climate change, listen to, the proposals and demands of the Public regarding climate change; as the presence of misguided sympathy and support for the Government at some of these protests reminds us, we should, however, be careful to ensure that the exposure of this falsehood is continued, and neither halted nor reversed by any of the concessions that the Government may be forced to make. The Youth Strikes have maintained their successes in the face of opposition from social conservatives and reactionaries, including prominent figures in the Government, who, themselves, now face criticism for their opposition from the majority of the Public, which has been mostly supportive of the Youth Strikes, potentially indicating the wider social approval of political dissidence and a growing criticism of the current governing bodies and political systems. Despite the many successes of the Youth Strike, however, we still need to actively support the participants of these protests in their actions, and to ensure that they are not misled or otherwise adversely influenced, by the false promises, solutions and concessions of oppressive organisations and structures of power. We should encourage and defend the growing consciousness that has been demonstrated at these protests, as well as the empowerment of its participants, and promote the potential, future actions of these participants by demonstrating our praise, support and solidarity regarding such actions and their participants, confronting the criticisms against them, and ensuring that the participants of the Youth Strikes do not feel isolated or limited to addressing climatic issues, and instead understand the intersectional nature of our struggles as a society. A growing concern is that the movement is at risk of becoming overly reliant on Greta Thunberg as a figurehead, and that it is already dependent on forcing states to meet its demands, as opposed to encouraging individuals and groups to act directly in opposition to such state; as a result, we should also certify that the Youth Strikes do not become overly dependent on any individuals or organisations, and that the participants understand that the successes and power of their movement is a result of them and their peers, independent of any hierarchy, bureaucracy or centralisation, which could otherwise potentially threaten them and their movement. We must provide our constant solidarity, support and guidance to the Youth of the Planet, who will play a fundamental role in shaping the better society that we, as Anarchists, strive for!